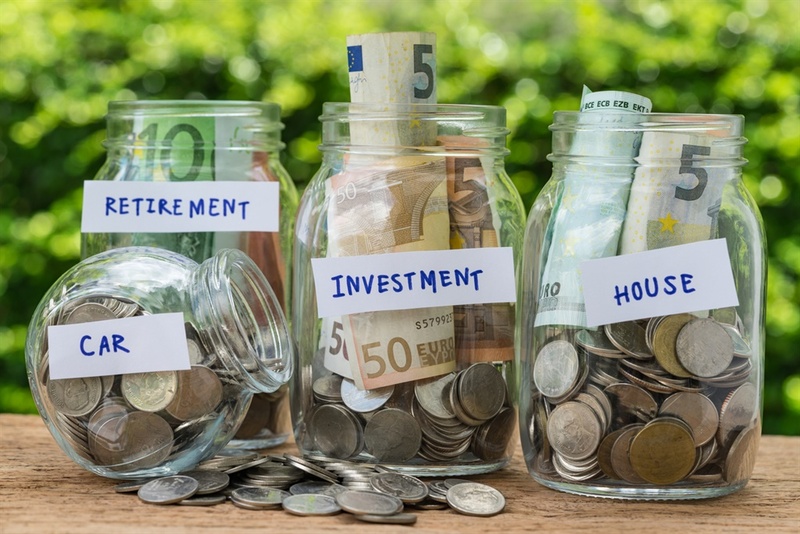 What's best, saving or investing? The stock markets have performed dismally over the past three years. Those who invested are no doubt wondering why they didn’t just stay in cash, considering that banks have been offering some great fixed deposit rates – Absa’s current annual 10.05% rate being a case in point (note to readers: its advert of 13% is misleading). If you can get 10% a year in the safety of a fixed deposit, why take the risk on a stock market that has delivered no growth over three years and which is susceptible to political noise? Last month, Alexander Forbes did some interesting research that offers a compelling argument. Its article focused on the difference between saving and investing. It defines savings as shorter-term bank deposits, while investing is done through growth assets such as the stock market. 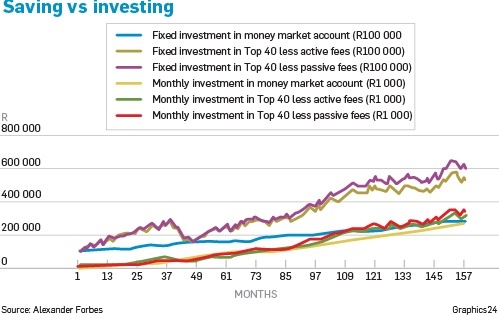 It researched the longer-term returns for money market accounts (savings) compared with the average returns one would expect to achieve from an equity investment – in this case, the Top 40 shares on the JSE. Shivesh Maharaj, head of retail products at Alexander Forbes, looked at two potential scenarios – investing or saving a lump sum of R100 000; and investing or saving a monthly amount of R1 000. The products compared were a money market account and an investment in the Top 40, where Alexander Forbes applied two different fees to reflect a passive fund or an actively managed fund. To test the return theory, it used a five-year period, a 10-year period and a 13-year period – which encompassed the global financial crisis of 2008/09 – to understand if the outcomes change when invested through a market crash. Money market rates are assumed to be set at the repo rate plus 1%, consistently. To put that into perspective, the repo rate is 6.5%, so the assumed money market rate would be 7.5%. The “active management” fee assumed was 1.3% a year, or 1.083% a month. The “passive management” fee assumed was 0.25% a year, or 0.02083% a month. The results are quite telling. Maharaj found that, over the total period of 157 months (May 2005 to May this year), the equity investment outperforms the savings products in both lump sum and monthly saving scenarios, however, for shorter periods, the results are mixed. In the longer term, the equity market performance is significantly higher than the savings performance – up to 2.13 times more for lump sum investments and 1.25 times for monthly investments. For shorter dated investments, there are mixed results, with the money market investment outperforming the equity investment in the five-year term by a small margin. Invest based on your time horizon: This confirms the investment theory that if you plan on investing for five years or more, you need to be invested in growth assets. But if you are looking at shorter-term savings, you do not want to take risks on short-term market movements and would be better suited in cash-like products. Fees affect performance: What is also interesting to note is the effect of fees on the returns from markets. Over time, an annual fee of 1.3% versus an annual fee of 0.25% resulted in a significant difference in final value. On a R100 000 lump sum over 13 years, the difference in fees effectively “cost” the investor R77 500. So, to make up for this loss, an active manager would have to outperform by 1.3% each year to add value.